The purpose of the meeting is to provide an ‘open communication’ forum within our community - with the opportunity for all in attendance to inform and to be informed. ‘Constable’s Report’ – during this period, our Precinct 4 Constables are in attendance to provide the previous month’s report for Prestonwood and engage directly with residents on any questions or concerns. ‘Financial Reports’ – the Directors provide the status of the Association financials, and invite residents questions for clarification. ‘Homeowner’s Forum’ – an open session for residents to discuss their ideas, suggestions, concerns and questions for open discussion – and an opportunity for all to gain a better understanding. ‘Committee Reports’ – each Director provides updates on activities, issues and projects related to specific amenities and services – and to provide clarification in response to resident questions. 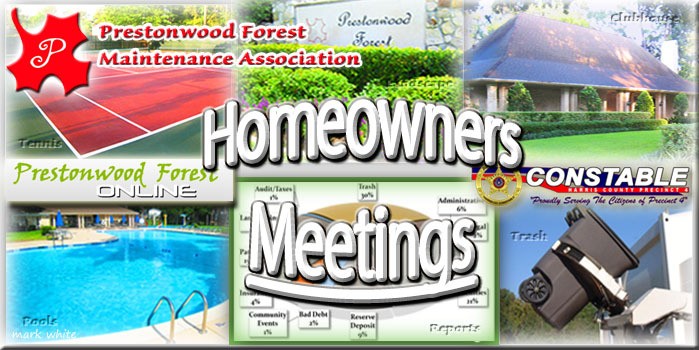 The monthly ‘Open Meeting’ dates are also identified on the Clubhouse Calendar (Residents may also schedule confidential issues to discuss with the Association during the Board’s ‘Executive Meeting’ by contacting the Management Company). For reference, a sample ‘Open Meeting’ agenda is posted below.